Although I was a little surprised that this story is not about the embezzlement of funds … (that’s what is usually meant by ‘cooking the books’ in the mafia movies, right?) the title still fits, as there is definitely cooking, and more than one book directly involved in this mystery. Full of unique characters, and plenty of drama, this book sucked me in by chapter two. There are so many options on who it is that might be harassing (and possibly plotting to harm) the main character that it keeps you reading to the very last page. One after another the potential villains’ plots unravel, but along the way the crazy antics of her relatives and friends remind me a little of the over-the-top craziness of characters from Janet Evanovich’s Stephanie Plum series. Though Bonnie’s female character, Sloane Templeton, may perhaps be even worse than Stephanie at handling a gun … at least in the beginning. 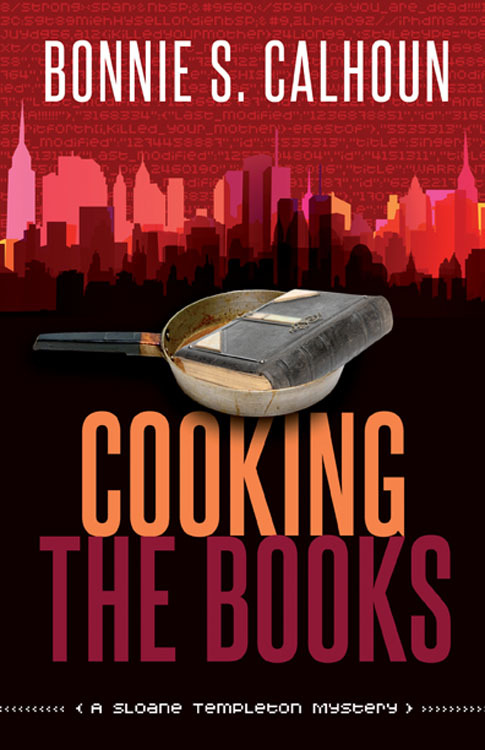 “Cooking the Books” does tackle a little bit of faith – in regards to learning to depend and trust on God and not on yourself alone – but its done in a manner that I feel even non-Christians would enjoy this book. Note: there is a bit of blood, guns etc. in this novel, as well as flashbacks regarding abusive relationships that might not be for everyone. However, if you are a fan of Law and Order or the like, it’s not any worse than that level. This is a very modern book cover design, which fits since this is a story set in modern times. The city skyline and modern font help to ground the book as an urban mystery … and the bits of tech font, and computer code allude to the elements of the mystery that appear to come from a skilled hacker. (Luckily, the main female character has skills and connections of her own!) I worry that some of the text may be a little too close in color to the background behind it and might not be readable on some screens. Also, I would like to have seen the skillet with the book in it at a slightly larger size, just enough so that the handle would have appeared to go off the page to the left and we could assume someone was holding it instead of it appearing to float in mid-air as it does now. Overall, I believe it is an effective cover. Just a few easy tweaks and it would be even better. Note: I received a digital copy for review so I have not seen the back cover design and therefore can’t comment on it. This title will be available from Abingdon in April of 2012. The following interview was conducted by me for the American Christian Fiction Writers (ACFW). Bonnie Calhoun is indeed one very busy lady. As she phrases it on her amazon.com author bio,“… sleep is sorely over-rated.” As a member of her blog alliance, the Christian Fiction Blog Alliance, I can testify personally that she has responded (unexpectedly) to an email from me to request a book for review in the wee hours of the morning – so I know she isn’t just saying that! Bonnie also publishes the Christian Fiction Online magazine, is the director of ACFW’s Northeast zone, teaches workshops on blogging and website construction at more than one writing conference, runs her own clothing design store, and still manages to teach a bible study and a weekly Sunday school class for teens. Bonnie, I confess that I get a headache even trying to imagine juggling the many roles mentioned in your bio. How do you stay organized enough to tackle so many things? Spreadsheets! I love Excel spreadsheets! And I think part of the penchant for organization comes from the fact that I am an “ENTJ” on the Myer-Briggs Personality test. I love it when a good plan comes together! You have been supporting other writers for some time, in many different ways, was this always with the intent of building a platform to support your own writing, or is that a happy bonus? It’s a happy bonus! Sometimes I find such easy ways to help people, and I can’t just waste those opportunities. The Lord gave me a great gift of organization and design, and that translates into being able to see the big picture. So anything that is furthering the Lord’s Kingdom is right on my work list. What’s your secret to staying up late (chocolate, coffee …)? Your characters in “Cooking the Books” are so zany and full of unique quirks. Are they based on real people, or what gave you the inspiration for some of their unique traits? They are a conglomeration of relatives and people I know. We all have zany characters in our lives. All you need to do is meld a few of them together to create a really fun personality. And if you have a single person that is uber-zany, so much the better…*snort-giggle*…just don’t name the character after them. One of the topics woven into your story revolves around the idea of tendencies for women of different generations in the same family to be drawn to the same type of man. What drew you to this topic? All of my stories will have the “bones” of an issue that many women deal with. I know many dysfunctional families that if you look back at their generations…their mom made the same mistakes, and so did their grandmas, in choosing unwisely. This is the time where we need to pray to break these cycles. And I am going to try and portray women who learn to overcome. What do you consider the greatest moment of your writing/publishing career (so far)? That is a totally easy question! Holding my first novel in my hands. (The box of author copies came this week. Holding them makes it all real in a tangible way that I can’t describe…but other published authors understand. Who is your writing support system? What writers do you feel have influenced your own writing style the most? 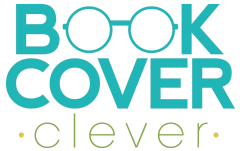 Jerry Jenkins, Brandilyn Collins, Robert Liparulo, and Janet Evanovich…in that order. Thanks for sharing with us, Bonnie, and congratulations on making it on the cover of Publisher’s Weekly with your upcoming book! Who didn’t want to kill Jim Fate – the confrontational talk radio host … ? In this second triple threat novel, a trio of strong female characters who formed a bond of friendship in the first novel of this series are back. One of the women is much closer to the investigation than she would like, having been close enough to the victim to be considered as a suspect herself if she isn’t careful. The other two ladies are dealing with their own struggles, one has an ugly event from the past resurface and the other handles a personal crisis with grace, thanks to her strong faith. A faith that isn’t shared by her two friends … just yet. I applaud the authors for their ability to create a thrilling story, full of plot twists and an array of possible villains, yet keeping the personal stories moving along for their three main characters. Their friendship grows tighter. We are able to see how events in their lives have shaped their characters, and how the faith of a friend can inspire hope in the lives of their friends – even if they don’t quite understand it. This is one murder investigation that keeps you guessing right up until the end. There are so many possible killers … This novel is fast-paced and SO easy to get sucked in and unable to put it down! The large block letters featuring the main author and title are pretty typical of this genre when the publisher is hoping the author is well-known enough that their name alone will assist in selling the book. The size of the letters, the bright red color against the flat black background, and the varnished surface definitely attract the eye of the reader first. But beyond the letters is the image of a pale-faced woman. Who is she? Her fly away hair, dark make up and watchful eye have you guessing from the very first page … Is she one of the women in the triple threat club? She’s not the victim and there is no widow … so, is she the killer? The author keeps you guessing on that until almost the very end. Mysterious and thought-provoking – the cover captures your attention and promotes its own sense of mystery before you even turn the page. It fits the genre, and should appeal to both men and women alike with the design style and also includes some great quotes from well-known reviewers that should also help make the book sell very well. This cover is doing it’s job, and should help this second triple threat novel become another best seller. * This book was provided for review by the book’s publisher via the BookSneeze book review program.